The At a Glance series pairs an instructional DVD lesson taught by a professional guitarist with a supplemental book for a comprehensive learning experience. Each book/DVD features several lessons pertaining to one topic, and the hi-def DVD lessons feature on-screen music. The lessons are loaded with valuable tips and information, and popular song examples help to demonstrate the concepts in action. 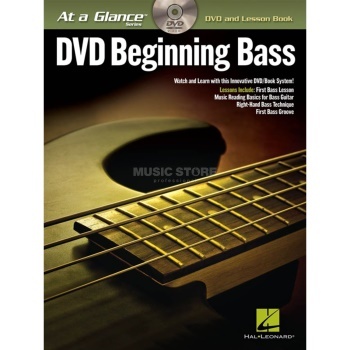 Beginning Bass features these lessons: First Bass Lesson, Music Reading Basics for Bass Guitar, Right-Hand Bass Technique, First Bass Groove. Songs include: Brass in Pocket · Crazy Train · Dancing in the Street · Eight Days a Week · I Fought the Law · Mr. Jones · Oye Como Va · Smooth · Thunderbird · What's Going On · You've Got Another Thing Comin' · and many more!